Posted 1906. 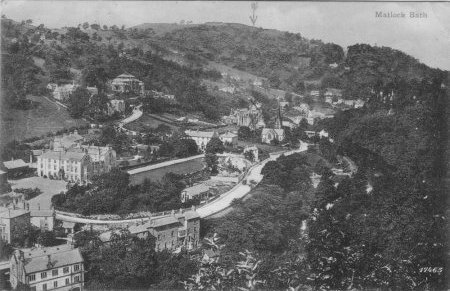 Hotel in middle left, taken from Wild Cat Tor, see this view in 1869. 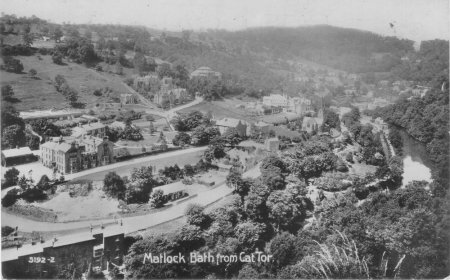 Located on New Bath Road, on the South (Cromford) side of Matlock Bath. 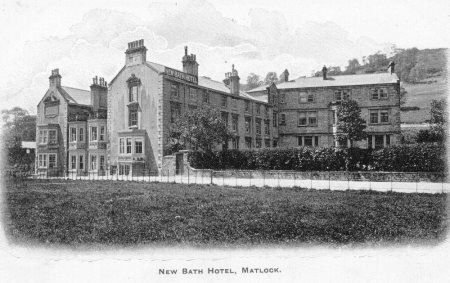 The New Bath Hotel at Matlock Bath has been reviving tired spirits since the year in which Prince Charles Edward Stuart, Bonnie Prince Charlie led his Jacobites as far South as nearby Derby. 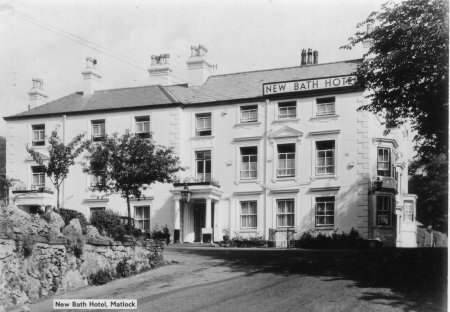 The new bath after which the hotel is named was a naturally heated spa bath opened in 1745 about a quarter of a mile away from the first primitive mineral bath which had operated since 1698. 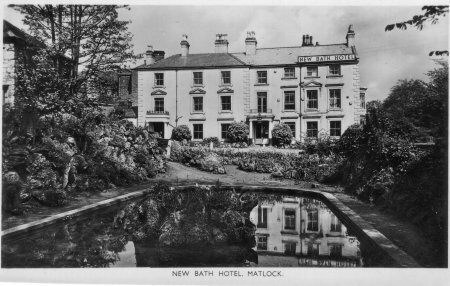 The New Bath, to distinguish it from the Old Bath had water "as warm if not warmer than the other Bath". 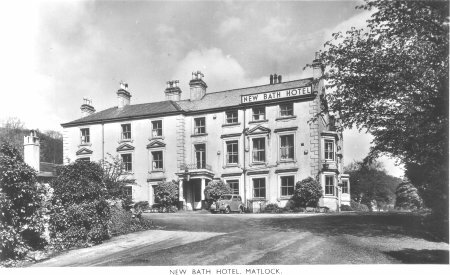 By the end of the 18th century the bath and its arched stone roof were incorporated into the hotel building. 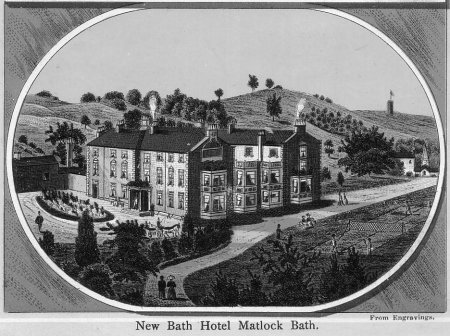 Today the "new bath" serves as the hotel's indoor plunge pool and is still fed by the waters of the mineral spring which emerge from the ground at a constant 68°F winter and summer. 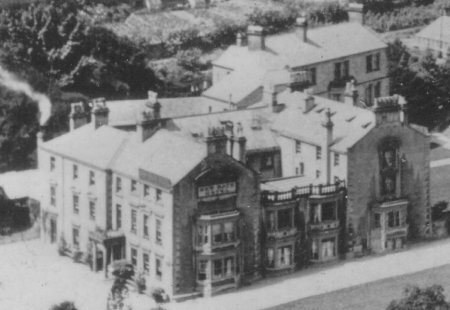 Since the 18th century the hotel has been repeatedly extended and now boasts a fine banqueting hall which can seat 150 and opens on to gardens providing a charming area to take pre dinner drinks. 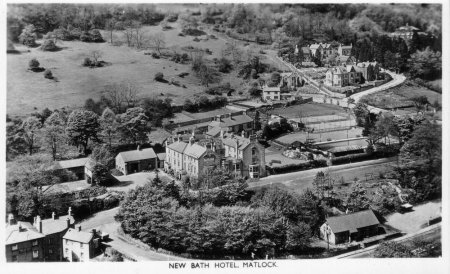 In the early part of the 20th century a large outdoor swimming pool was opened in the grounds which is in use from May to September. As with the indoor pool the water is naturally heated to 68°F. On the opposite bank of the River Derwent there is an outflow of spa water from the New Bath Hotel - it is warm and 'steams' in winter and has left a calcite deposit on the bank of the river. A hundred metres upriver a fine steel footbridge (not marked on some OS maps) crosses the Derwent. Enlargement from 1910 real photo.